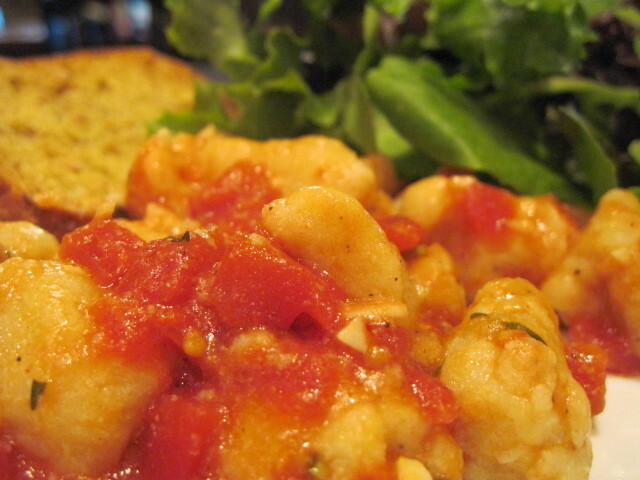 I have never made gnocchi of any sort before so I was anxious to give this recipe a try. It was fast, easy and delicious. I hope you’ll try it because I know you’ll enjoy it as much as we did. -Stir together the ricotta cheese, eggs, Parmesan Cheese, thyme leaves, salt, pepper and garlic powder in a large bowl until evenly combined. -Mix in 1 cup of the flour. -Add additional flour if needed to form a soft dough. -Divide the dough into 3 or 4 pieces and roll into 1/2 thick ropes on a floured surface. -Cut each rope into 1 inch pieces. 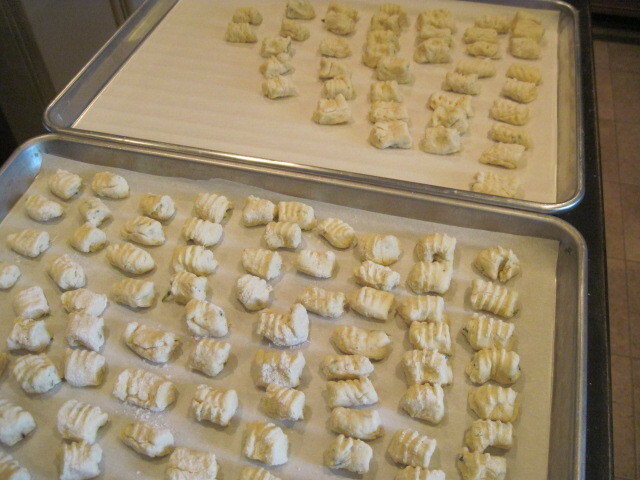 -Roll each piece down the back tines of a fork to create the lines commonly found on gnocchi. -Put individual pieces on a parchment lined baking sheet and place in the freezer until ready to use. -Heat the olive oil in a saucepan over medium heat. -Stir in garlic and cook until softened (about 1 minute). 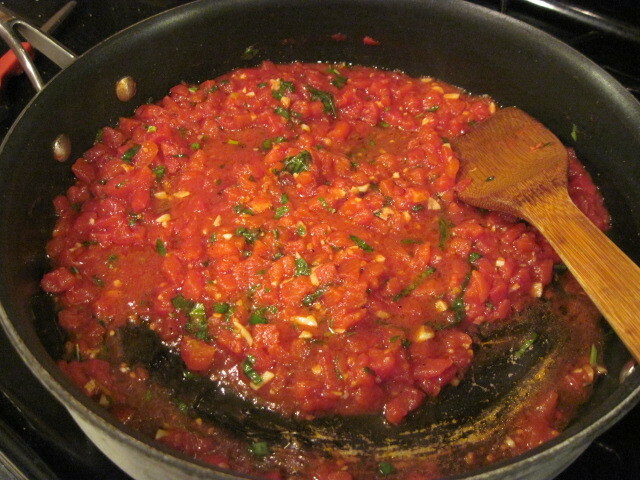 -Pour in the diced tomatoes and red pepper flakes. -Bring to a simmer over medium-high heat and cook for 10 minutes. -While the sauce is simmering, bring a large pot of lightly salted water to a boil over high heat. 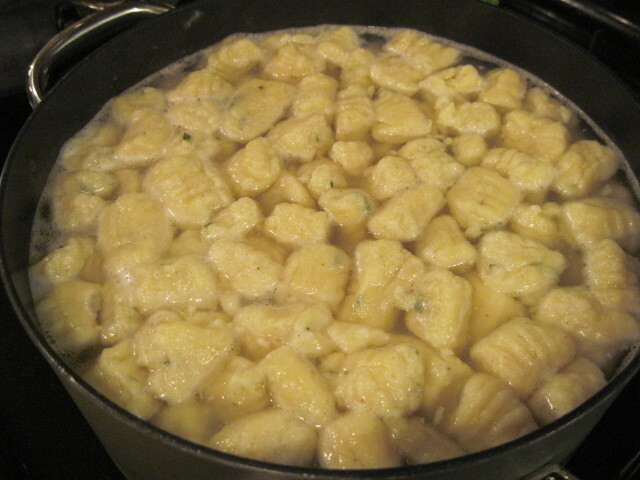 -Add the frozen gnocchi to the pot and cook until they float to the surface (approximately 10 minutes). -Using a slotted spoon, remove gnocchi from cooking water and immediately add to the saucepan and toss gently to coat the gnocchi with the sauce. -Top with the freshly chopped basil. Having never made gnocchi before, and not having an Italian background of grandmothers and mothers to watch in the kitchen, the process of ‘forking’ the little gnocchi was a bit challenging for me. The dough seemed a bit too soft to get a good roll off the fork. However after a bit of practicing it became easier. I did find that adding more flour to the dough made it quite a lot easier to handle. Dinner is now served. These little pillows of heaven are light and flavorful with a sauce that is fresh and not at all overpowering. I served this meal with a side salad of baby greens and some whole grain roasted garlic ciabatta bread. Oh my, it was tasty! Looks great!! I am going to give this a try. 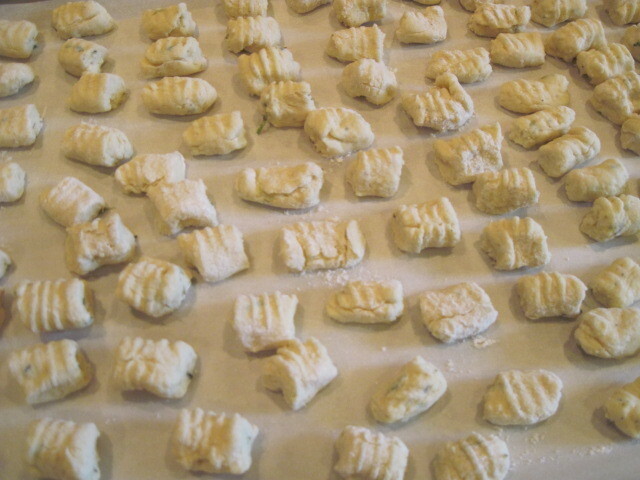 I did grow up watching my Italian grandma make gnocchi and I think she'd be proud of you! I've never attempted it but would love to try. Yours looks delicious. I know it's a lot of work, too. 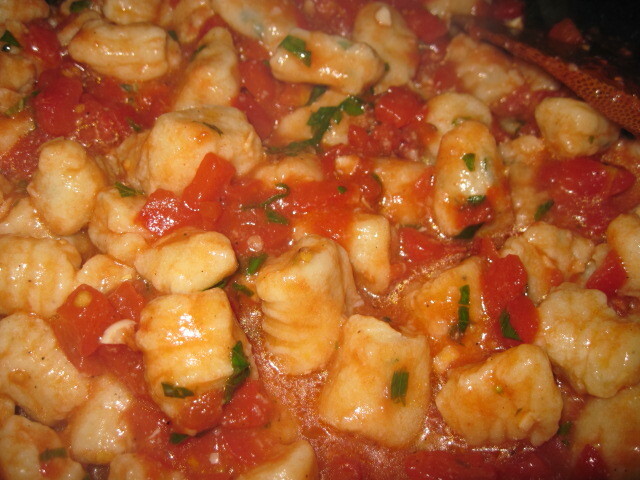 I have read this recipe name Ricotta Gnocchi for the first time.I like that you have given this recipe with its pictures so it is easy to understand it.This seems tasty recipe and I would like to taste it. 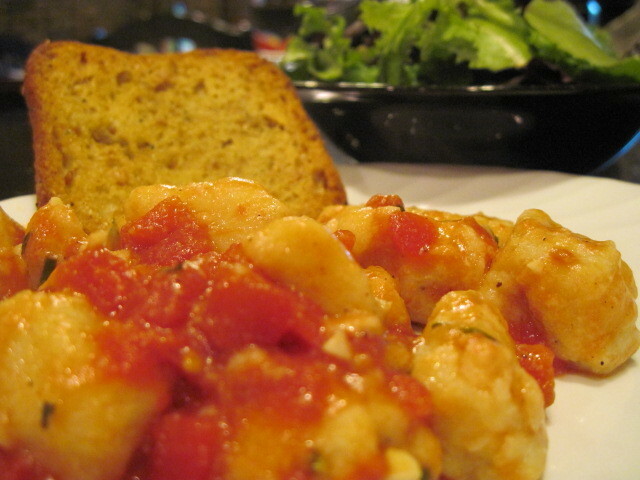 Ricotta Gnocchi seems to be very delicious. I always had a fancy towards Italian food but never heard of this dish. But after looking at it I will definitely try it as I loved it. Ricotta Gnocchi always been the best Italian dish I have ever known. Italian are great on taste and spices and have lots of varieties to offer. I always try this kind of new dishes whenever I get time as I am a food lover.